Welcome to Cofish International - Designer and Supplier of worlds best foul weather gear and the world-famous Alaskan Fisherman's Slipper. 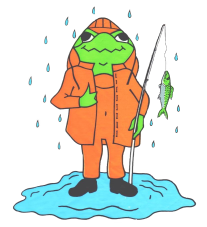 Easily recognizable by the frog logo on the chest, the Cofish name has been associated with the best in fishing equipment since 1900 and has been known as the best source for foul weather gear since the 1960's. The word is out: Cofish is not just for fisherman anymore!! Cofish gear is also being worn at construction sites, on tree farms, in the logging industry, on the farms, maintaining ski slope operations, in seafood markets and in food processing plants. Cofish is the preferred gear of people from all walks of life, who work and play hard and demand the best and most comfortable in foul weather clothing. It features heavy duty material, quality construction, flexibility in any weather, great fit and machine washable all at a reasonable price.Once you try our gear, you'll never buy another brand! We have found that some customers are having trouble finding some of our gear since most dealers stock some of our items but few dealers stock all of them. If you have found this to be true of your local dealer you can contact www.newrivernets.com 910-327-1231. They are next door, sell retail and ship UPS or USPS everyday.